SCOTTSDALE, Ariz. – May 8, 2018 – Barrett-Jackson, The World’s Greatest Collector Car Auctions®, has built incredible momentum and achieved major milestones, setting a new bar for the collector car hobby in the first quarter of 2018. Incredible dockets filled with rare and unique vehicles, including a current-generation Ford GT and a Lexus LFA Nürburgring Edition, along with some of the biggest names in sports, entertainment and politics – such as former U.S. President George W. Bush, Jay Leno, Burt Reynolds and Michael Phelps – have helped drive the excitement level of the Barrett-Jackson experience. Since its 2017 Las Vegas Auction, Barrett-Jackson has exceeded over $187 million in total sales and raised nearly $8.3 million for charities across the country. During that time, Barrett-Jackson has sold 3,000 vehicles and anticipates more than 600 vehicles will cross the block during the Northeast Auction, bringing the total vehicles sold over 17 auction days to more than 3,600. Automobilia sales have also seen remarkable growth with countless top-dollar sales, including a full-size transportation-themed carousel that sold for $557,750 in Scottsdale. Barrett-Jackson’s registered bidder numbers also continue to climb. Among the most celebrated milestones achieved by Barrett-Jackson was surpassing the $100-million mark in total donations made to charity since the company’s inception. During last year’s Las Vegas Auction, the collector car community rallied together to help raise over $1 million for Las Vegas first responders. At the 2018 Scottsdale Auction, Barrett-Jackson kicked off its first-ever yearlong charity initiative, called “Driven Hearts,” to raise much-needed funds and awareness for the American Heart Association. In total, more than $6.2 million was raised for both local and national charities at the event with the help of former U.S. President George W. Bush and Chad McQueen, the son of Hollywood star Steve McQueen. Thus far, 2018 also has been a stellar year for collection sales. Steve Todhunter’s prestigious collection was featured in Scottsdale, while three impressive collections – including renowned collector and philanthropist John Staluppi’s highly coveted Cars of Dreams vehicles – sold in Palm Beach this year. During the four-day Palm Beach Auction, the 145 vehicles from Staluppi’s collection sold for an impressive $13.96 million. Celebrities from across the entertainment and sports realms, along with political leaders, also have played a large role in driving the excitement of the Barrett-Jackson auctions. 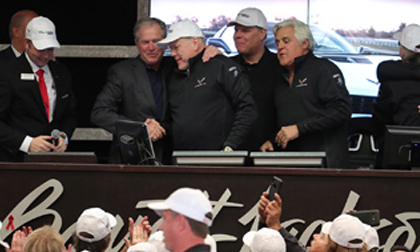 In Scottsdale, former U.S. President George W. Bush, along with Jay Leno, Michael Phelps, David Spade, Tim Allen, Alice Cooper, Bruce Arians, Alan Williams, Archie Bradley and Arizona Governor Doug Ducey joined in the auction action. Celebrities who attended the Palm Beach auction included Jimmy De Martini, fiddler with the Zac Brown Band, as well as Hollywood icon Burt Reynolds and actor Alfie Wise, North Carolina Panthers head coach Ron Rivera, NASCAR legend Rick Hendrick and former NFL wide receiver Reggie Wayne. Barrett-Jackson will host two more auctions in 2018, including the 3rd Annual Northeast Auction from June 20-23 and its 11th Annual Las Vegas Auction from Sept. 27-29. Follow this link to consign your vehicle or click here to register as a bidder.